A long-distance ride is the dream of every biker. Getting away from the daily chaos and hectic schedule is only possible when you own the right bike for a long-distance tour. Whether you want to visit the hills, scale the mountain passes, or you want to go on a long road trip; all you need is a soul mate motorcycle that will never leave your side. Imagine riding on the Himalayan roads and the snow-clad mountains welcoming you with wide open arms. Riding on your bike on these roads is nothing less than riding with your soul mate. The long journeys to the far destinations are blissful. It is not about a style statement or showing off. Most of the riders try to find the answers in a long ride. It is about the passion for becoming an explorer. To fulfil your passion, you will need an apt bike as a soul mate in the journey. The engine size is measured by the cubic centimetres or CC. It is the real indicator of the power of a motorcycle. The engine volume determines the way your bike will perform. Whether you want a sports bike, a touring two-wheeler or a cruiser, the engine size is a mandatory part of the factors to consider before investing in a motorcycle. The normal bikes have an engine volume ranging from 125 cc onwards. A bike for tours and long-distance journeys should have an engine volume starting from 250 cc and above. The terrain types, performance, and other external requirements will often need a higher engine volume. It can reach up to 800 cc. Remember, the price of the motorcycle increases with the engine volume. The next important point to consider is the style of the motorcycle. There are three categories broadly, to help find the difference and understand the pros and cons of each. Cruisers are the large and heavy bikes that are used for longer rides. This design type can handle almost any kind of terrain. The maximum speed of the cruisers will be lower than the sports bike due to the extra weight. Cruisers are ideal for long drives, weekend trips and destination journeys as the engines are built for long heavy-duty performance. Sports bikes are the popular Japanese or Italian machines built and specifically tuned for a high-speed journey on a straight and plane road. However, these bikes are not suitable for a long-distance journey due to the seat arrangements and comfort. Touring motorcycles are specifically designed for long-distance journeys. The seats and adjustment of the engines are done accordingly so that the rider can find utmost comfort and less trouble. These long journey bikes are not designed for power or speed. The seating, storage compartments, and other features are added to meet the needs of a long journey. The height of the seat is the second most important thing you should see while finding a soul mate for long journeys. The seating will be adjusted as per the need of the rider. You must remember that both your feet should comfortably touch the ground when your bike is not moving. You also should not feel any difficulty in steering the bike. Heavier editions are better to absorb the turbulence imparted by vehicles passing you. A long-distance bike is normally heavier. Too much weight can be a drawback though. The measurement of torque is absolutely necessary in order to understand the bike’s capacity of maintaining the top speed uphill. Torque is measured in kg/m. Natural calamities like floods, earthquakes, etc. A motorcycle for long distance journeys is the dream of every biker. 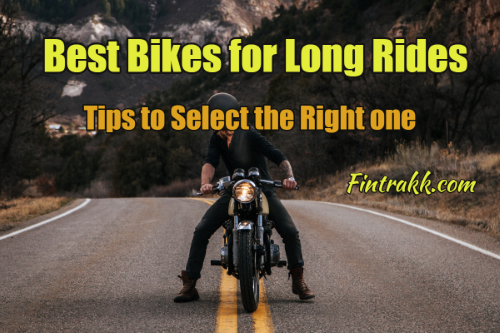 Find the best bike as per your preferences and type of journey and ride with the wind. But don’t forget to buy bike insurance online before you commence your journey.